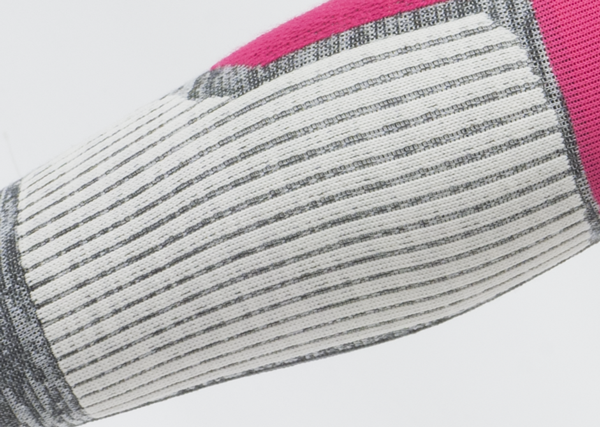 Intelligent socks know where the shoe presses. The protection of calf while doing sports is essential. The thicker the cushion, the better the protection. But the fact that such stockings can literally strangle the air out of a person has been ignored by all sock manufacturers. Except us. We have developed a sophisticated cushion system which perfectly protects and allows air to circulate even within the shoe. The rod-type structure of the padding allows air to move, so in the case of an impact, the pressure is not transferred to the skin but escapes to the sides. This way the shock is not only buffered in one direction but three ways and in three directions.